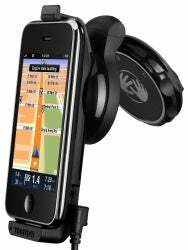 Will TomTom iPhone app mean the end of one-function devices? Are you lost? I don’t mean metaphorically, I mean literally: are you at this very moment stuck in an unknown location, scratching your head and wondering if you should have taken that left turn at Albuquerque? Well, if you don’t mind waiting a bit—and forking over some cash—help could be on the way. TomTom has announced that its car kit for the iPhone will ship in October for $120 (or €99 if you live on the other side of the Atlantic from me). The GPS-maker first pimped the kit at Apple’s Worldwide Developers Conference in June, where it was vague on pricing and release date. Since then, the company has released a series of navigation apps, including a $99 GPS iPhone app for the U.S. and Canada, which you can see our own Jason Snell giving a trial run with your own eyes. A TomTom executive did tell Macworld that the car kit would not be required, but would enhance the experience by providing a more powerful GPS chip, built-in speaker, power cable, and more. What we still don’t know is precisely what’s included in this $120 package, which supports the original iPhone, iPhone 3G, and iPhone 3GS. However, you still have to buy the TomTom app separately, meaning the cost of this whole solution rises to a pricey $220—more than the cost of some of TomTom’s standalone units. The same TomTom executive told Macworld in the above interview that the company will offer a bundle of the two, but it gave no further information about that in its press release. I guess it’s a question of just how devoted you are to getting un-lost. Update: Apparently I'm incapable of reading three-line press releases. TomTom says the app must be purchased separately from the car kit.